Attention parents of the world. If your child is a social media maven and can text and send embarrassing “selfies” at the speed of light, I have bad news for you. The more you tell them no, the more likely they'll go right out and do it. Safety and privacy are the biggest concerns of parents in the digital era. Personally, I'm always concerned of the broader impact online activity might have on a child’s reputation. Parents need to take an active role and do their homework if they want to protect their kids from online behaviors that might put them at risk. I was chosen to be one of the first persons to try a new social media platform that gives you complete control over your social media. BackPeddle is a new app that allows you to choose how long your photos, videos and texts live online by setting a customized expiration date. The simple truth is that at the end of the day, most of kids (and adults) are uploading their entire lives into social media, one click at a time. When you really stop to think about what this means, it can be truly scary. With BackPeddle you can control the destiny over all your online postings. Now you can share in the moment and edit after the moment. You can take back the stupid things you posted the night before, or, at the very least, the picture proof that it happened. BackPeddle gives you your very own edit-me “do-over” button. • Ever change your mind about a post? With BackPeddle, you can easily delete any post from ever existing. It’s that simple! 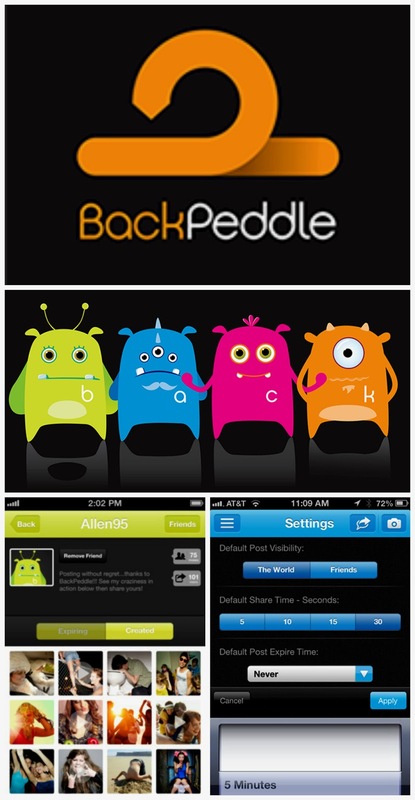 BackPeddle is your social self-editing safety net that gives you control over your shared visual content. Finally, you have the comfort and freedom knowing you’ll have a second chance to make that often-pivotal first impression.